Titos Tacos is not only a dive, but is also an institution. If you grew up in West Los Angeles, you would know what I’m talking about. They have been at this location for over twenty years. The line never ends, no matter what time of day you go. If you talk to the people in line, you would inevitably run into people like me who have moved out of the area but still come back for a dose whenever they are back in town. A couple of ladies I was talking to while waiting for my order now live outside of L.A., but happened to be in the neighborhood, so they were stocking up on burritos and tamales. 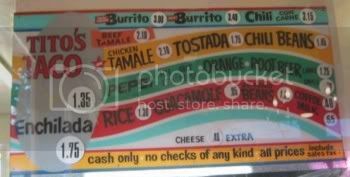 The menu is simple and straight forward, the prices have not changed much either. 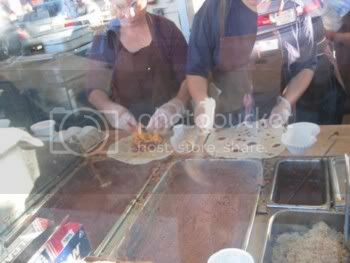 The food is nothing special by most standards, just chile con carne, made into tacos, burritos, tamales or enchiladas. Served alone or with beans and/or rice, and the always present homemade chips and salsa. Actually everything is homemade, even the guacamole. Titos Tacos is comfort food. Something you remember from your childhood that somehow has infused into your veins. 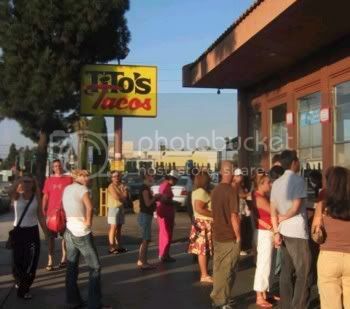 Though the lines usually stretch all the way to the sidewalk, the wait is never as long as you would expect, thanks to the well oiled operation that Titos Tacos is. They have a large staff of ladies and men who turn out your orders in a jiffy. It really is a marvel to watch. The food is just as comforting as I remember, when we used to drive down from our high school, which was just down the street on Venice, for lunch or for an after school snack before heading home. One of my high school friends who went home to the Philippines for college would always make a point of getting her Titos Tacos fix whenever she came to visit and she always ordered extra to freeze and take back with her. I do the same, I make this yearly pilgrimage now that I live out of state, just to get a dose of nostalgia. We grew up eating Tito’s. Now the offspring eats there, a family tradition. Nice blog.